This path surrounding the Lagoa, or lagoon, is a local favorite. 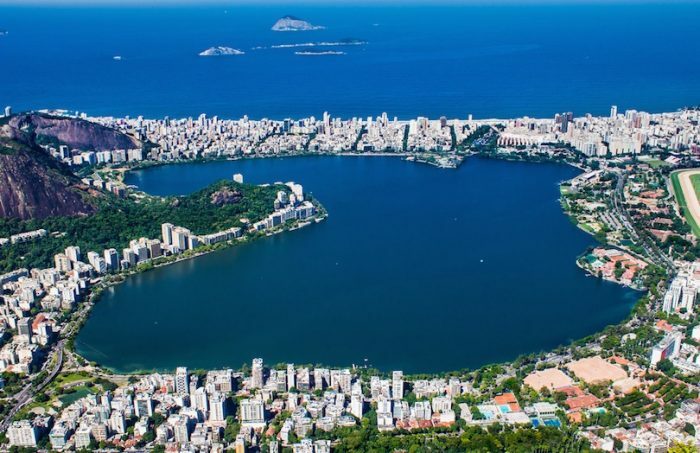 It features views of the statue of Christ the Redeemer at the top of the Corcovado mountain, as well as closer hills such as the Morro do Cantagalo, Morros dos Cabritos and the nearby National Park of Tijuca. The path is geared to runners, with distances marked every eighth a mile and booths selling fresh coconut juice (one of nature’s best electrolytes). Although one might be tempted to cool off in the lagoon after a run, unfortunately the lagoon is too polluted for swimming. A better post-run option is to enjoy the open-air cafés and restaurants (with stunning views of the lagoon and the beaches beyond) along the lagoon shore.